Bank of the West and Mellon Bank New York move to stop funds going to Hamas, then release them. Paul LaRudee is an impassioned supporter of Hamas and the Palestinian revolution against Israel. He operates the Northern California chapter of the International Solidarity Movement. In 2006, Paul LaRudee was stopped trying to enter Israel under a fake identity as Paul Wilder in order to try and bring aid to Hamas. That case resulted in a Supreme Court case in Israel as pro-Hamas elements tried to legally allow him to stay in that country. I provided evidence back then that got him deported. You can read about that here. LaRudee, after being deported, went to Lebanon next to meet up with Hezbollah during that summer’s war with Israel.. LaRudee has been involved with the Gaza Flotillas to bring material aid to Hamas in Gaza for the last several years. He was arrested and detained during the Mavi Marmara incident when terrorists on board one of the ships attacked Israeli soldiers seeking to stop the ship on the high seas. Palestine Children’s Welfare Fund (PCWF) in Texas is a nonprofit charitable front also for Hamas. Its website used to hold art contests for Palestinian children to draw suicide bombings of Israelis. 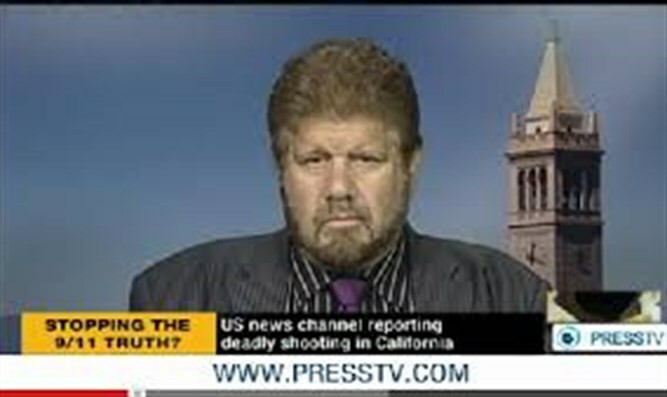 The head of PCWF according to police in Texas committed suicide several years ago after the FBI raided his offices. Hamad was found drowned in Lady Bird Lake in Texas, his hands bound with tape and his mouth taped up. Despite the tape, the local police ruled his death a suicide. Paul LaRudee took over the finances for PCWF and continued raising money to be sent to the PalestinIans as “charity.” Although PCWF was in Texas, LaRudee ran it from his home in El Cerrito, California as he started another fundraising organization, Palestinemovement.org on the West Coast. Despite photos of him shaking hands with the head of Hamas in Gaza, and even receiving an award from Hamas, LaRudee continued to call it "charity" work for Gaza. The US Supreme Court recently ruled that terrorist organizations could not be exempted from having their funds seized in the US by saying the funds are apolitical “charity” for poor civilians. This angle was used repeatedly during the war on terror to raise funds for terrorist groups. Paul LaRudee wired $3,750 US to a bank in Lebanon that was allegedly to give the money for food and blankets to the Palestinians, a.k.a. Hamas in Gaza. LaRudee was so used to abusing the system he addressed the funds to Hafez Assad. Hafez Assad was the former dictator of Syria whose son Bashir now runs whatever is left of the country. It got him caught. The funds were to be wired through Bank of the West in California that relies on Mellon Bank in New York or overseas transactions. The money was really meant for Hamas in Gaza. LaRudee must have gotten away with this procedure for quite a while to use the name of a dead dictator. However, an alert bank employee at Mellon Bank thought this particular money transfer looked suspicious. Responsible banks strive to intercept funds meant for terrorism, but most don’t bother. Bank of the West didn’t, but Mellon Bank did. They froze the funds, asking for more information. LaRudee began asking the funds be sent back to PalestineMovement.org and himself. Bank of the West began to smell a rat and asked for more information about who Hafez Assad is. LaRudee began blitzing the banks and their legal departments with emails from his acolytes across the country. "At one point, we thought we might have a breakthrough when we received a statement from Bank of the West Chief Counsel, Quinn Osborne, that Bank of New York Mellon was in fact refusing to return our funds without the information that they were requesting about the beneficiary of the transaction that we cancelled, the Charitable Association for Palestinian Refugees. We needed this in case they continued to hold the funds even after we provided the information, so that we could demonstrate that their action is illegal. "No sooner had we submitted the requested information than Mr. Osborne informed us that BNY Mellon would not be returning the funds. None of the requested information was relevant, because the transaction had been cancelled and we had instructed that the money should be returned to our account, not to the beneficiary. To give you an idea of the absurdity of most of the questions, however, you are welcome to read the text of our letter, which we sent to Tanya Kazak, Bank of the West VP for Compliance. "Take it even more public. This morning we issued a local press release in order to carry the message farther. We are considering national or even international outlets, but we are starting with our local area. If you have press contacts, please refer this to them. Sue them in small claims court. It turns out that even nonprofit corporations can use such courts in California for amounts up to $5000. $3720 plus a $45 transaction fee may be pocket change for Bank of the West and especially BNY Mellon, with more than $1 trillion in assets, but for Palestinian refugees and our tiny nonprofit, it is worth all the trouble. Continue the boycott and sanctions campaign against Bank of the West. Although BNY Mellon is holding our funds, Bank of the West is accountable for them because we are their client, not BNY Mellon's. We are hoping to use the power of you, the people, to restore justice in this instance, and to make Bank of the West see the wisdom of settling the matter without further damage to their reputation. We intend to seek help from public officials and agencies. We have already filed a complaint with the California Department of Business Oversight for financial institutions. In addition, we plan to follow up with the members of Congress and especially Barbara Lee, in whose district we are headquartered. We welcome your help in this regard and hope to have contact and reference information for you soon. "In the meantime, we have a new number for you to call, that of Bank of the West Chief Counsel Quinn Osborne, +1 402 918 1623, and his fax is +1 402 918 5482, email quinn.osborne@bankofthewest.com. He is the main contact with BNY Mellon and responsible for assuring that their instructions are followed. He needs to hear from you. "Thank you for all your support. We are going to win this one." A PCWF page likewise did the same. Bank of the West isn’t responding. Are they going to return the money to La Rudee and his Hamas enthusiasts or are they going to honor national security and confiscate it? Indications are the banks might give LaRudee the money back just to be rid of the problem. Their refusal to accept information, photos and other items that prove LaRudee was sending money to a false identity in Lebanon for transfer to Hamas in Gaza is particularly vexing as the War on Terror drags on. We can only hope Bank of the West does the right thing. As of February 25th, Bank of the West retrieved the funds from Mellon Bank that provided them to them and LaRudee and company were back in business. These funds which were allegedly sent to the poor in Gaza were in fact sent to Lebanon addressed to a dead Arab dictator. Both Mellon Bank and Bank of the West caved to an email bombardment and sent the money back. Bank of the West should be ashamed. Americans should be worried that our banking industry in helping to fund one of the worse terrorist organizations in the world. One thing is certain, Bank of the West may just refuse future wire transfers from LaRudee and company. If so, only then does the bank deserve the patronage of Americans.